To evaluate all factors influencing the fuel consumption a simulation model (TRANSTEP) was developed, in order to estimate fuel consumption and greenhouse emissions for all the fleet in each line. • Instantaneous fuel consumptions for specific events (accelerations, decelerations, cruise velocity and idle) for different slopes and traffic conditions. This data can be obtained experimentally by installing a flux meter in the bus. An alternative solution is to use numerical simulation models that can estimate on a micro scale level the fuel consumption of a predefined bus running in a specific line. 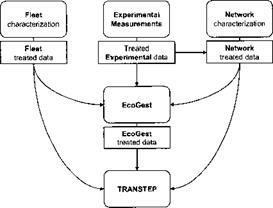 In the present study the authors used a numerical model developed at Institute Superior Tcnico named EcoGest 0. Some of this data can be supplied by the bus operators or by the vehicles manufactures. However, experimental measurements in normal operational conditions are always needed leading to a complicated and cumbersome task. Fig. 1. Scheme of interaction ofTRANSTEP and its components. Since it takes too much time to evaluate every single line and bus for different periods, the methodology involves the selection of two or three characteristic lines for a detailed experimental evaluation. This experimental data is further on treated and fed into TRANSTEP. • Elasticity of each parameter influencing fuel consumption. With these results it becomes possible to identify measures in order to improve the company’s energy efficiency and, therefore, reduce the fuel consumption of the fleet. These results are also used to estimate greenhouse emissions based on fuel conversion factors into C02 emissions (for diesel vehicles green house emissions are basically C02 emissions), see Table 1. Sources: National Air Emissions Inventory, UK Greenhouse Gas Inventory, Digest of UK Energy Statistics DTI 1998, Greenhouse Gas Inventory Reference Manual IPCC 1996 (http://www. defra. gov. uk/environment/envrp/gas/05.htm). normal operational conditions at different periods of the day and week, in order to allow the characterization of peak and off peak hours, and week days versus weekend days. During experimental measurements data is collected regarding the topography of each analyzed line, vehicles dynamics (speed versus time and distance), significant events, occupancy rates, atmospheric conditions and road surface conditions. • Laptop, for data logging. For this case study, it was not possible to install flux meters in the buses, therefore our in-house developed numerical model – EcoGest was used to estimate the instantaneous fuel consumption. These data was then calibrated with measured data regarding monthly and annual fuel consumption. In this particular application, two measurements methods were adopted, one with the equipment installed directly in the bus and other with the equipment installed in a car that followed closely the bus along the route, thus emulating its dynamics. In the first case the equipment was installed in the front of the bus and the electric feeding was provided by an auxiliary battery as presented in Fig. 1. Fig. 2. Experimental measurement’s equipment installed in the front of the bus. Fig. 3. Experimental measurement’s equipment installed in the lateral of a car.